Sorrel Hill is easily approached along the well defined track starting at the small car park at O04387 10862 A. The road leading up to the car park can be somewhat potholed on the higher section. Another word of caution – Ballysmuttan Bridge at O05650 14812 B has been closed for a lengthy period of time. (October 2010). (You will be glad to know that there is a shiny new bridge erected over the Liffey now!) This is a common route to the Black Hill/Sorrel Hill car park, and it is an awkward and lengthy detour to the car park if you first arrive at the closed bridge. Better to approach from Blessington/Lacken to the west along the N81. It is just over 1km to the top of Sorrel Hill with an ascent of about 150 metres. The main track to the summit is muddy at times. [See track-1596 which uses an alternative and less boggy route that lies slightly to the east]. 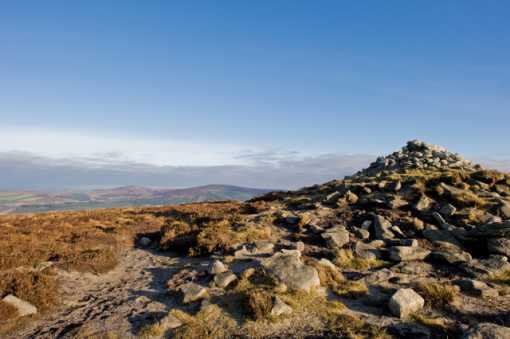 As you climb views emerge of the Blessington Lakes to the west, and the plains beyond. 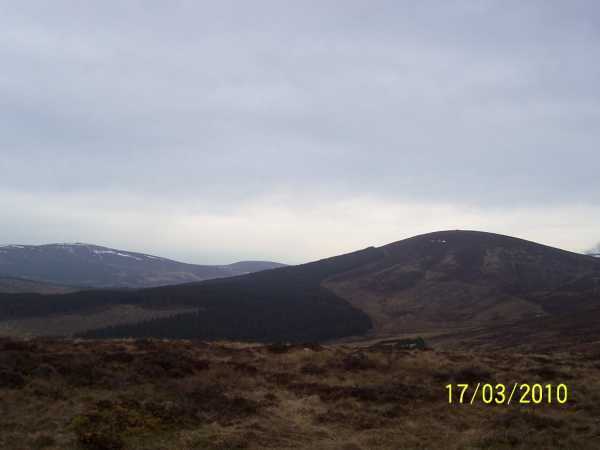 The bulk of the Mullaghcleevaun group of hills is directly to the south, while the Seefin – Seahan circuit of hills is to the north. Kippure holds court off to the east. An alternative route to Sorrel Hill is from Ballynatona to the north. There's space to park a car at the entrance to the forest track at O055 138 C, which you can follow to within several hundred metres of the summit. There is ample carparking available at O045108 D. From here one can clearly see the track snaking up toward black hill. Fine views over Blessington and the reservoir are available. Directly behind you there is another clear track leading up toward Sorrel hill which will take you directly to the summit. Once on the summit you will note the huge cairn which marks the top. 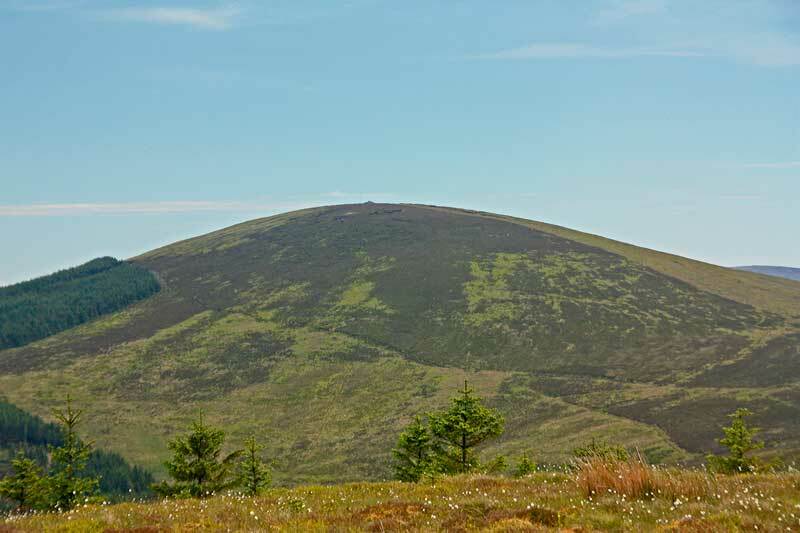 In Irish, I have seen this hill referred to as ‘Cor tSamhaidh’, the Round Hill of the Sorrel. The sorrel in question is obviously the plant of that name, called ‘samhadh’ in Irish (‘Rumex acetosa’ in botany). It is the long-leaved common sorrel that often ends up in our salads. One would therefore expect an abundance of the plant here, if it did give its name to the hill, yet I have so far never found a specimen. Then again, I have never gone out avidly looking for one, either. 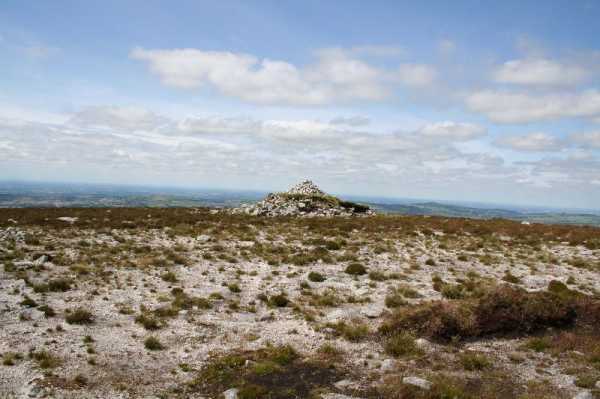 Leaving this botanical conundrum aside, the most notable feature on Sorrel is the megalithic cairn on its summit, which has a diameter of about 20m. (Enterprising modern hands have added a further small cairn to the original beneath.) In the photo, just to the left of the mound, can be seen in the distance the cluster of Seefin, Seefingan and Seahan, equally crowned with megaliths. These hills lie between 6 and 8kms away, across the valley of the Liffey. There are other remnants of the past in the immediate vicinity, too, though they are difficult to find. 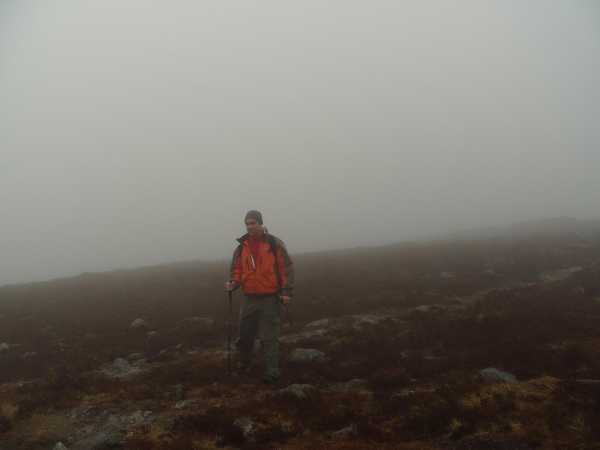 On the broad saddle between Sorrel and Lugnagun there are, reportedly, traces of several Stone Age enclosures (detectable in aerial photography) and another cairn about 10m in diameter, but I have looked for them in vain in this very broken terrain. A little further on, inside the forest fence, there is a small megalithic tomb (marked, this time, on the OSI map), but now so hemmed in by forest that it is in danger of being totally engulfed (Coillte protecting our heritage!). Picture from Dessie1 : Where am I going! Picture: Where am I going!